The Daily Digress: Quinoa Week comes to an anti-climactic close. Quinoa Week comes to an anti-climactic close. Well. I don't love this recipe, but I liked it. And it was all I had the energy to make after a few days in Charleston for their Fashion Week. According to the Weekly Beet, I may be suffering from PFST. I agree with this diagnosis and must acknowledge that I may also be suffering from PCFS*. To aid my recovery, I'm eating nice and clean and avoiding alcohol, for at least a few days. I am one-hundred percent sure I'll be drinking heartily on Friday night, when we're finally going to Orangeburg to try Four Moons. TF almost gave up alcohol for Lent like he has never in the history of the world managed to do, but he tries and fails does every year. Honestly? I don't even think he tries that hard. Because if he is trying, and continues to fail, don't we need to acknowledge he has a problem. And doesn't that mean I, too, have a problem? Why don't you shut-up, fun hater? So, he's our driver, because Four Moons is far, far away, y'all. And if I'm going that far for a meal, I'm going to wash it down with plenty of bubbly so I can pass out for the long drive home. But I digress. 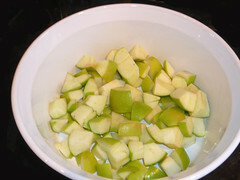 Pre-heat your oven to 350° and cut up a few apples. Put them in a buttered casserole dish. 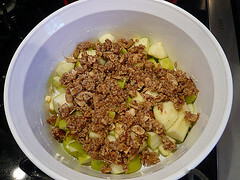 Sprinkle the apples with cider vinegar or lemon juice. I feel sure white vinegar wouldn't be the end of the world. 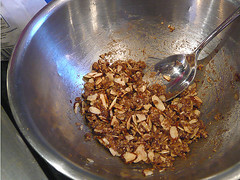 In another bowl, mix 1/2 cup cooked quinoa, 1/2 cup sliced almonds, a few big spoonfuls of sugar, quite a few shakes of cinnamon, a dash of salt and about 1/4 cup melted butter. Stir all that together**. 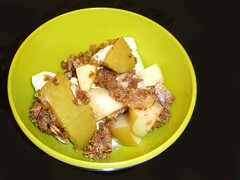 Spoon the topping over the apples. Bake it until the apples are soft, 30 to 40 minutes. Spoon it over ice cream and drizzle a little bit of honey to add sweetness if you like. Honestly, this will not be the most decadent dessert you've ever eaten, but it's a nice way to use up the end of that huge bowl of quinoa you cooked at the beginning of the week and it's pretty satisfying. Besides, it's pretty healthy, especially if you used frozen yogurt, which would probably complement it better than the rich, full-fat vanilla my kids bought with the twenty dollar bill I gave them while I waited in the car with the Tank, who was in no condition to go into a grocery store. I was going to send the X-Man in by himself, leaving O. at home alone for a few minutes (He's almost 11. Don't call CPS. Also, he is pretty smart.) However, the X-Man requested his big brother's help for the adventure because, he explained, "Sometimes I get kind of shy." Aw. Incidentally, one of the most amusing things I ever did with those two was give them $5 and send them into Palmetto Candy and Tobacco*** with orders to buy whatever they wanted without asking for more money or fighting. They were five and eight years old and I sat in the car just outside the store with a sleeping infant and waited. I had taken them there before and didn't want to deal with the drama. Palmetto sells candy in bulk and they have big barrels of candy from bulk packages that ripped. The barrels are labeled "5 for $1," "10 for $1" and so on. There is at least one barrel with big stuff, each item costing a whole dollar. And there are sodas. And bags of potato chips. Anyhow, I think it's a fun place for kids to go, a Columbia institution, but I couldn't deal with the (literal) nickle and diming once we were inside. So I gave them the money and the orders. And I prayed. In less than eight minutes, they left the store, skipping past the cigar store Indian standing guard by the door, right behind a house painter heading back to his van and laughing his head off. In their little hands, they held more candy than they had ever owned at once. In an effort to save the environment, they decided they didn't need bags. There was candy spilling from their pockets, their shirts, their clenched fists and their socks. They were laughing so hard they could barely breathe. And they had change from the $5. I had one of those "Oh." parenting moments. I avoided the whining, they felt really proud of themselves and kind of bonded over the whole experience and I didn't even have to wake up the baby. They learned about budgeting and teamwork. It was the feel-good moment of the year! Why didn't I think of that? P.S. I have ordered something new and exciting, for me at least. My new thing is a Flip Video MinoHD Camcorder . I'll mostly use it for my other blog, but I'm sure it will prove useful on this one, too. Perhaps I will film myself dying my own eyebrows. Maybe I'll take higher quality videos of my lawn. Perhaps I will film TF snoring. Don't warn him, m'kay? I haven't gotten it yet, so if anyone knows of any reason I should not be wedded to this cute little camera, speak now or forever hold your peace. Opinions welcome. * Post-Child-free Syndrome. Oh. My. Gosh. It was awesome. The first two and a half days were also husband-free. No offense to TF, but that was pretty awesome, too. Waking up whenever I wanted (9 am-ish,) eating breakfast in peace, showering at leisure, spending the whole day meandering...and I didn't have to rush back to get ready because, with no one around to "help," I can shower, relax, put on makeup and get dressed in fifteen minutes. And I wear a lot of makeup, y'all. ** Sometimes, I like to over-use the sharpen function in photo-editing software because it makes the food look more like dishes in a seventies cookbook, which I like. Discuss. Or not. *** Which my nephew used to call "The Candy Meadow." How cute is that? Quinoa polenta--sliced, fried in ghee and topped with maple syrup? I rilly like 70's cookbook photos, dawg.